Two-Way Wooden Pallets are ideal for storage and transportation of heavy duty machines and equipments. These pallets can be lifted by two sides using a forklift or hand jack. 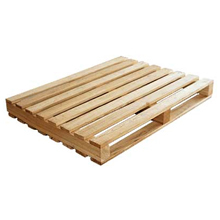 Made from best grade hard wood, these pallets are available in different sizes as required by clients. We make sure that the wooden pallets are heat treated for durability and strength.